Keke Rosberg seems to be making a serious bid to take over from Niki Lauda as F1's top old fart commentator; in the last week he has made quotable comments to just about every journalist in sight, opining the hell out of the sport and its participants. On this showing, Niki needs to look to his laurels, on productivity at least. Look at the range of Keke's thoughts too - you name it, he has an opinion to offer. From Hamilton to Fisichella, BMW's chances to Vettel, Keke has it all sewn up. And it is hard to argue with such sound reasoning as well. Yes, Hamilton will have a much more difficult year given the expectations raised in 2007, of course all the rookies are going to have to prove themselves against more experienced team mates, and BMW are indeed hard to assess, given their initial problems with the F1.08 and their inconsistent testing times. Here is a commentator at the peak of his game, treading the sure and solid ground, avoiding the wild and fanciful. Keke has chosen the right moment to make his move as well, Niki having already revealed that he thinks Ferrari are way ahead; after that, there is not much to speculate on, is there? With consummate ease, Keke has seen the gap and slipped by the old statesman. The others are also-rans, of course. John Watson makes his occasional bid for fame but usually gets lost in the pack, Prost's appearances are so rare that he might as well stay in the pits, Jackie Stewart is wrapped up in a personal battle with Max Mosley, and Damon Hill has enough on his plate with trying to ensure Silverstone's survival. So what has brought on this sudden leap of Keke's into the spotlight and will he be able to maintain such scintillating form? The plain fact is he finds himself with time on his hands. In an unguarded moment, he let slip the revelation that Nico, his son, rarely discusses the job with him: "When I talk to Nico, we talk about other things; he tells me nothing (about F1), even when I push him! ", he said. Ominous news for Lauda, methinks. With little to do in helping his gifted son towards stardom, Keke is free to pronounce his opinions at every opportunity. Never one to hold back when an overtaking move presents itself, the old warrior has seized his opportunity and sprinted into the lead. And I, for one, am glad that Keke has done so. Niki is always good for a few quirky viewpoints but is desperately handicapped by his Ferrari fascination. Keke brings a new approach to the game, actually trying to tell it like it is with no holds barred. He was always honest, even admitting on his retirement from the sport that he felt that Prost had beaten him (prematurely, in my opinion - he did not give himself the benefit of taking luck into account). We shall see how the year pans out but I suspect that we have seen the emergence of the new king of the ex-champion commentators. Go Keke! I laughed when I read that Rosberg had called Schumacher a "Drecksack"-literally a Dirtbag! Not all the world is in love with numbers. 2008 will be the year of the celebrity dads. they've all taken a look at spotlight lewis' dad created for himself last year and fancy a piece of it. f1 drivers are busy enough during the year, if their dads can create a bit of press, keep their profiles up then that's great help to them. piquet snr. i'm sure will have plenty to say as the season moves forwards. I find it quite surprising that Piquet Sr hasn't had much to say about the coming season yet. Perhaps he's trying to hold his tongue until Nelsinho has cemented his position with Renault. It's great to see all the old sparring partners coming out and engaging in verbal debate, however. I think Keke's sudden re-emergence is because he will be commentating on races for German TV this season so he will be at every race. I guess with all the second generation drivers it was onl a matter of time before the first generation turned up. I can just imagine what F1 would have been like if Paul Stewart and Matthias Lauda had made it as drivers and Tomas Scheckter had avoided kerb crawling. Every race meeting would have had JYS, Niki, Keke, Jody, Nelson etc all with different teams and all competing with each other. The arguments would make good TV. 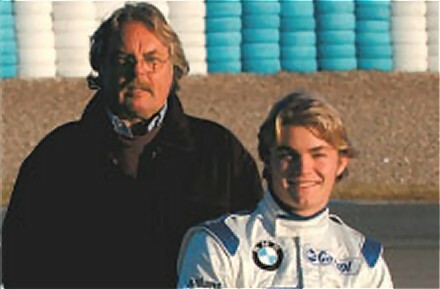 Of course, Lauda's son was rather less gifted - maybe Rosberg feels he's got one over his old sparring partner. No doubt, Patrick, no doubt. Nico looks like being the best of the second generation drivers.